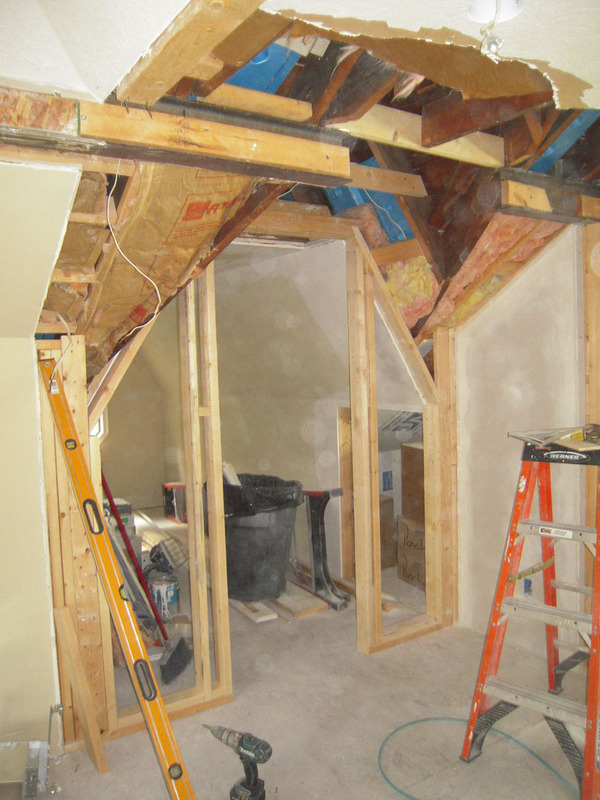 Greetings fellow renovators! Sorry for a late post, still working away on all kinds of things at the MisAdventures project. 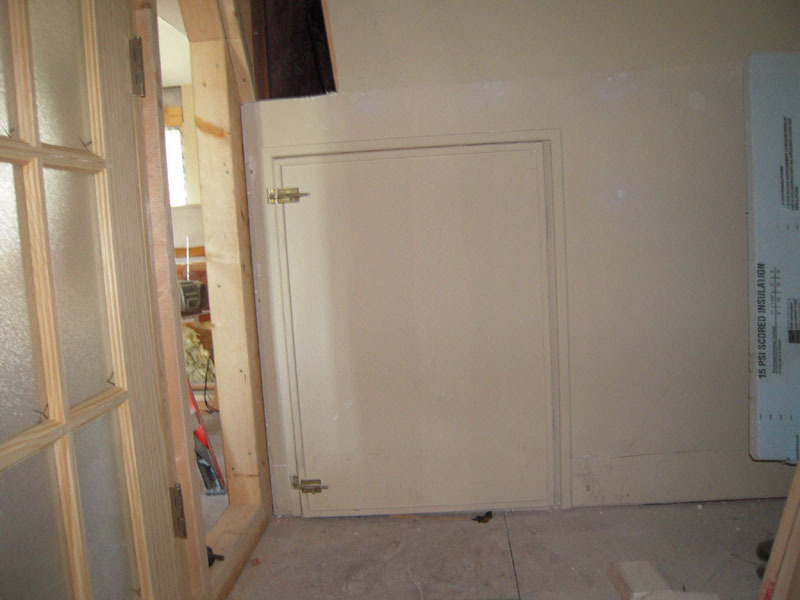 I’ll introduce a 3 part series on the pointy closet that gave me so much trouble. Three posts? Yep, you’ll see. So let’s start at the beginning of this closet odyssey . Well, maybe not at the very beginning. This is the earliest photo I could find of my destruction. 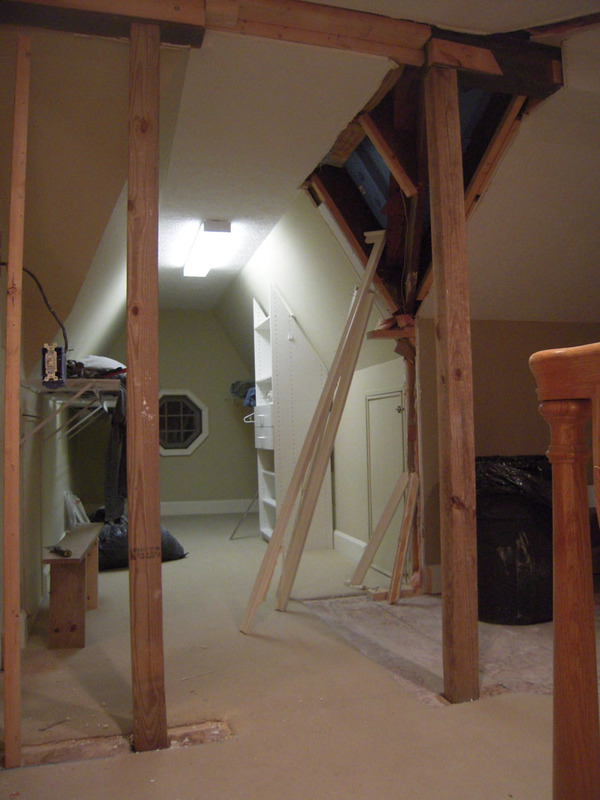 This is the 2nd floor closet that I’ve already got my destructive little hands on. I can only imaging what my wife was thinking when I started tearing this apart 7 years ago. Yep 7 – and it’s not done yet – but we’re getting close. We’ll revise this little problem closet several times – you’ll see. 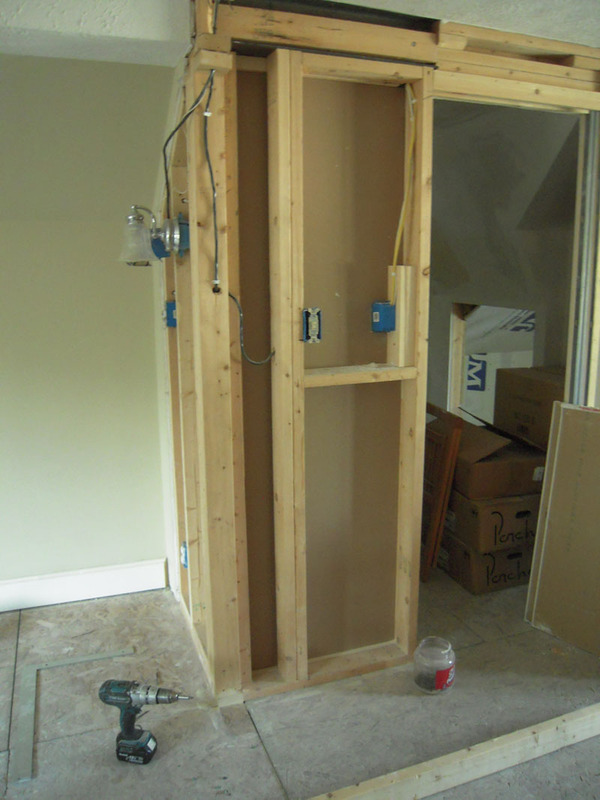 Here I quickly framed out the new closet space with a nifty pocket door. I thought I had it all figured out. 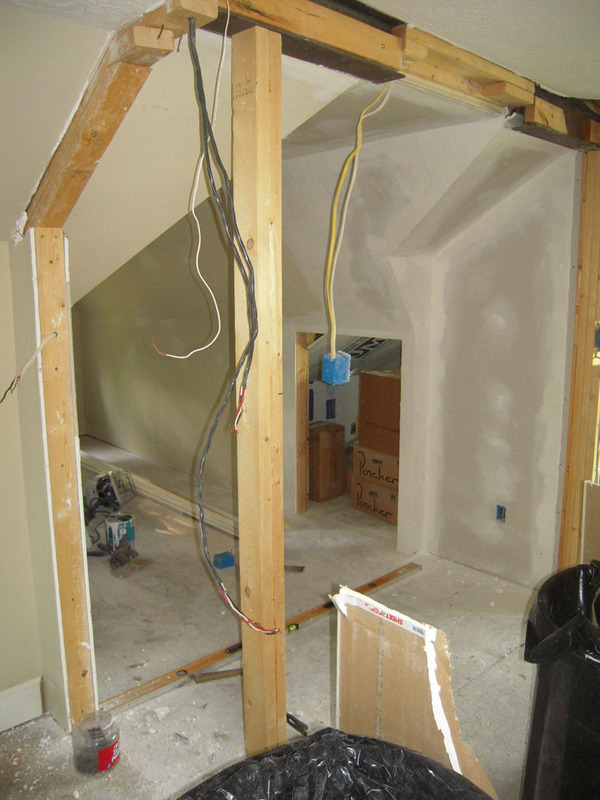 It wasn’t long before I had drywall cut and in place, with all those fancy angles. Moving along quickly – what could possibly go wrong? 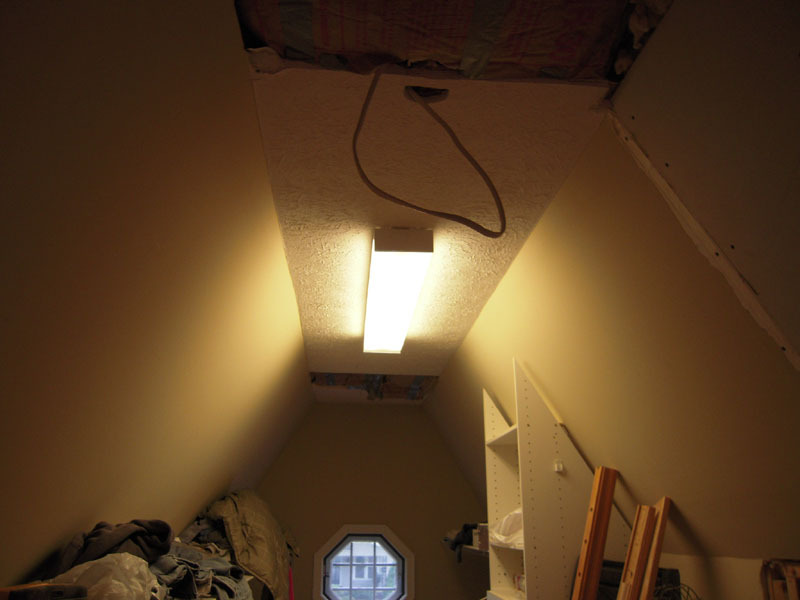 I cut out the ceiling to remove the surface mount florescent light. 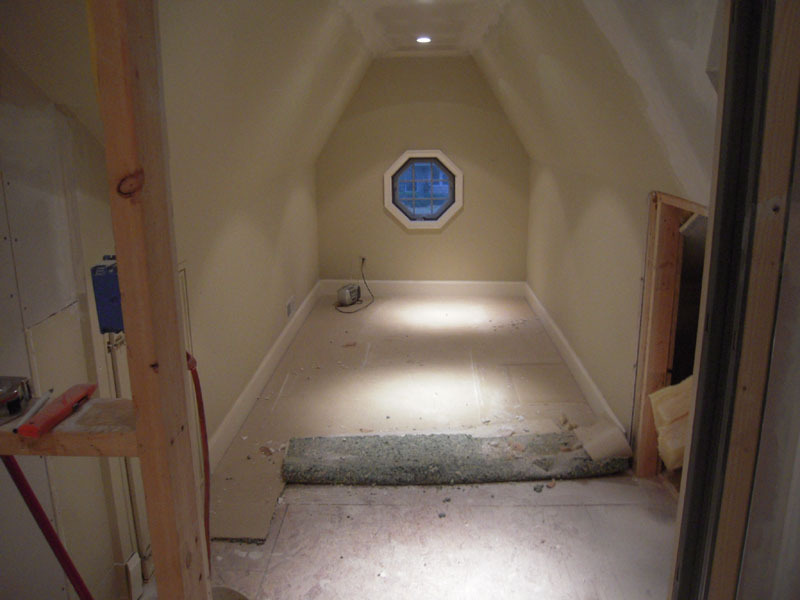 And will a little time and materials, I have a new ceiling with recessed lighting. Almost done – I can see the finish line. 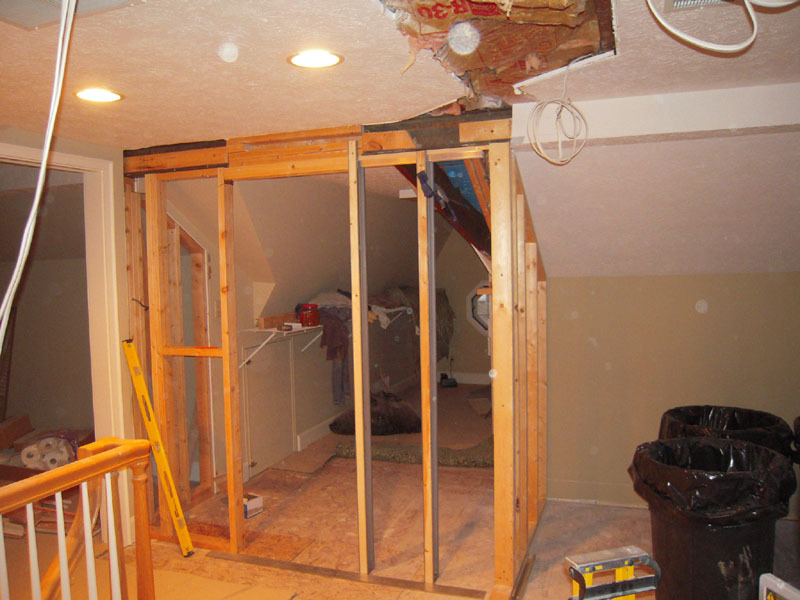 We just need to drywall this end and we’re home free! I’m so close to getting this closet done! Just a couple more pieces of drywall. Crap! I knew it couldn’t be that easy. It’s right here – at this very moment in time that I had another ‘what if’ moment. Those are always bad for me. I decided to replace the staircase with a new, safer one. That will mean the walls of the closet will be too close, so here we go! I’m removing all the stuff I just did. There’s a lonely brand new little switch box just dangling there. This will have to be moved back to allow a landing for the new stair layout. 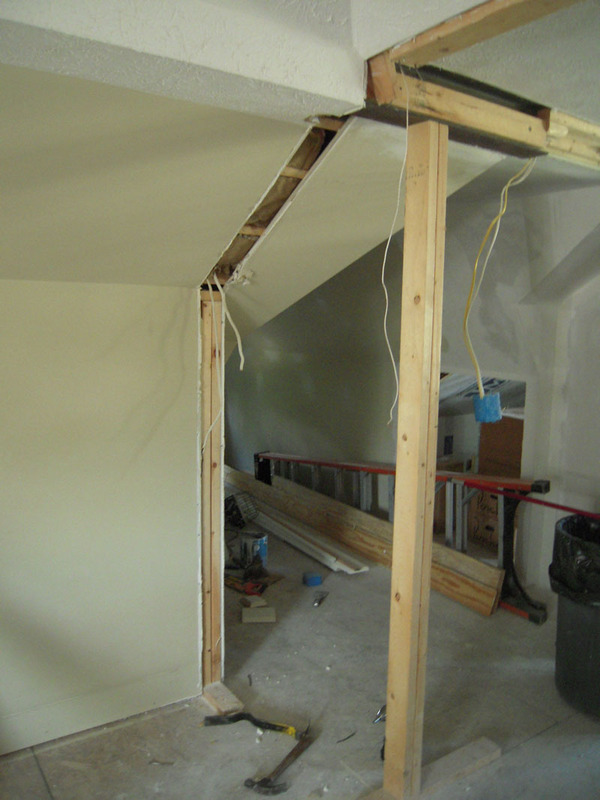 I always use construction screws to build walls – just for this very reason. Simple to unscrew everything and use again. 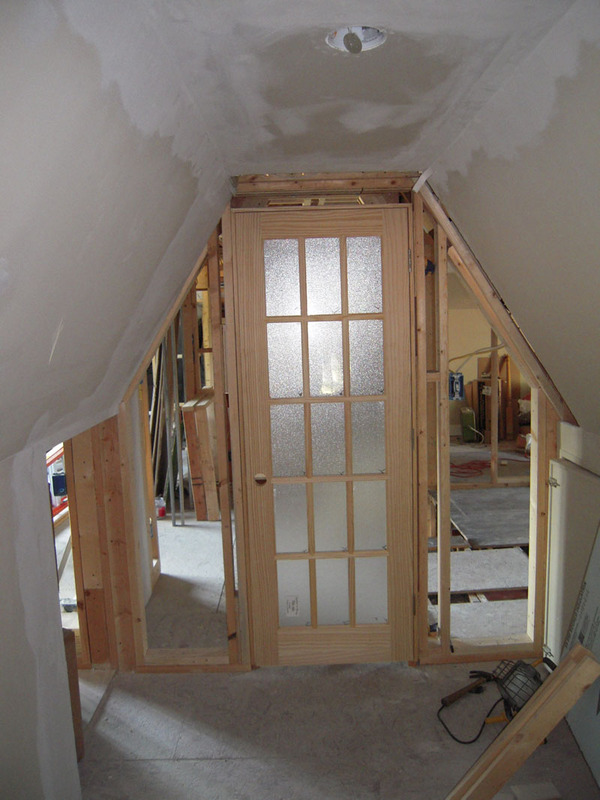 The new door location is framed in place. We’ll have to ditch the pocket door because we don’t have enough space to retract the door. It’s always something. 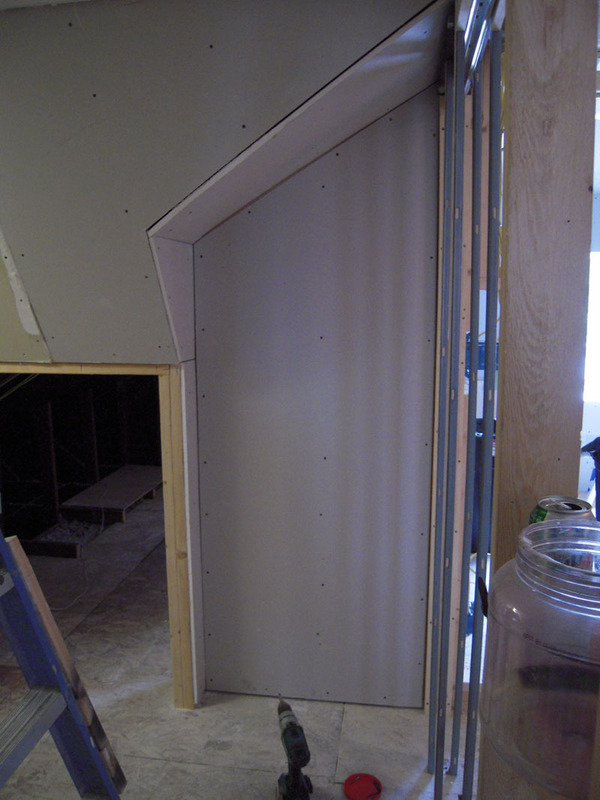 We’ll use a 15 pane door with textured glass – just like the 1st floor bathroom door. This will let light in through the closet window. So I think I’m finally getting everything in place – surely we won’t make any more changes here. But these little access doors to enter the eave area kinda bugged me. Not quite the fit and finish I like. 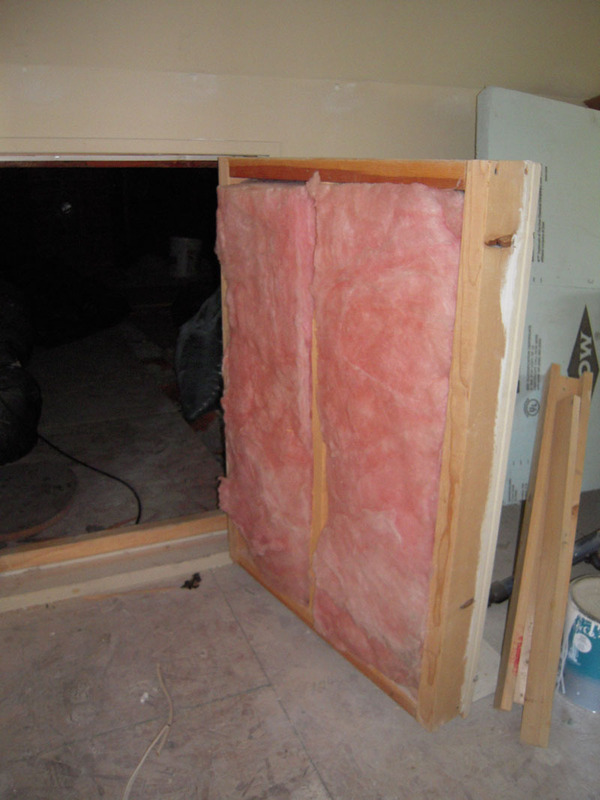 They were made to be insulated, as the space under the roof in these areas was not insulated. And behind that little door it looked like this. 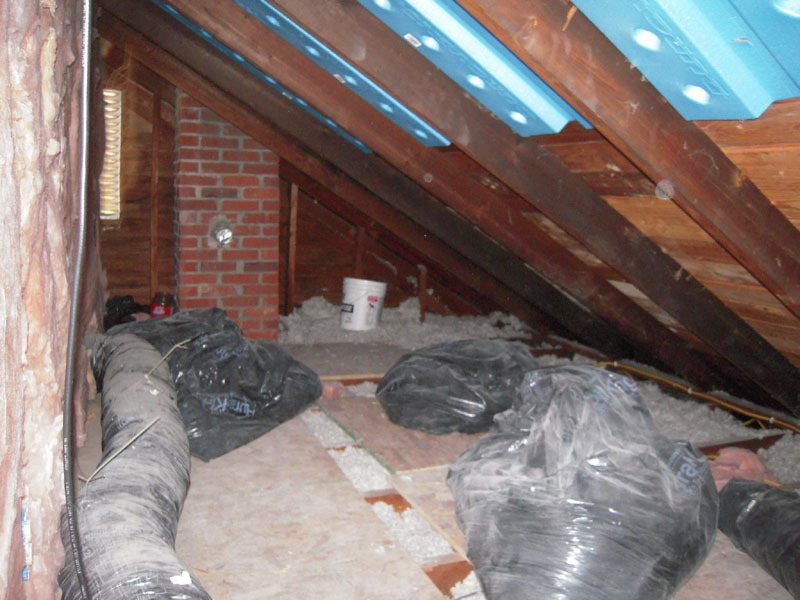 This area is unconditioned space, The white bucket was used to catch water flowing in from the chimney area decking. The chimney had a pipe coming out the side with a piece if tin foil over the hole. Nice. We gotta fix all this. And this lame little window too. This is a sad little room without any character. I’m feeling the demo demon grabbing hold of me. Please someone help me. 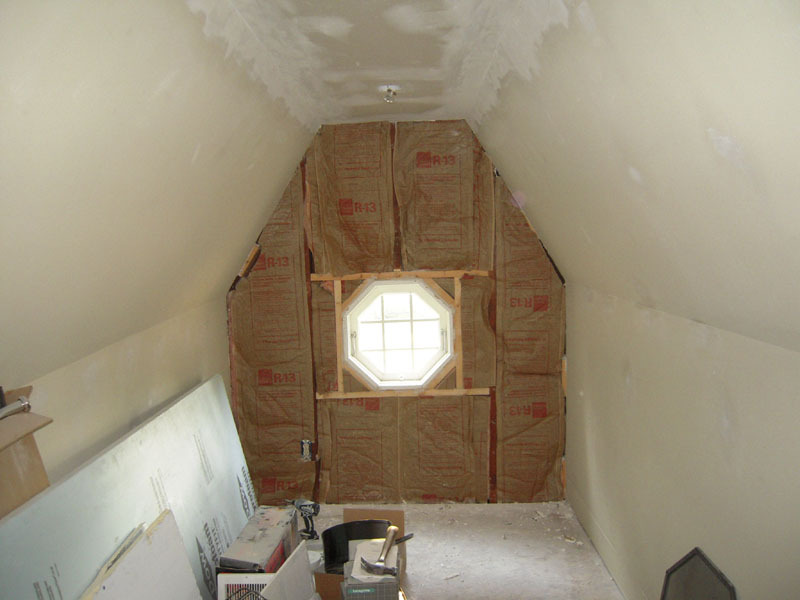 That window will need some attention, so off comes the drywall. Of course to make this look good inside, we have to make it look good outside too. Here I’ve stripped all of the aluminum siding off the front. 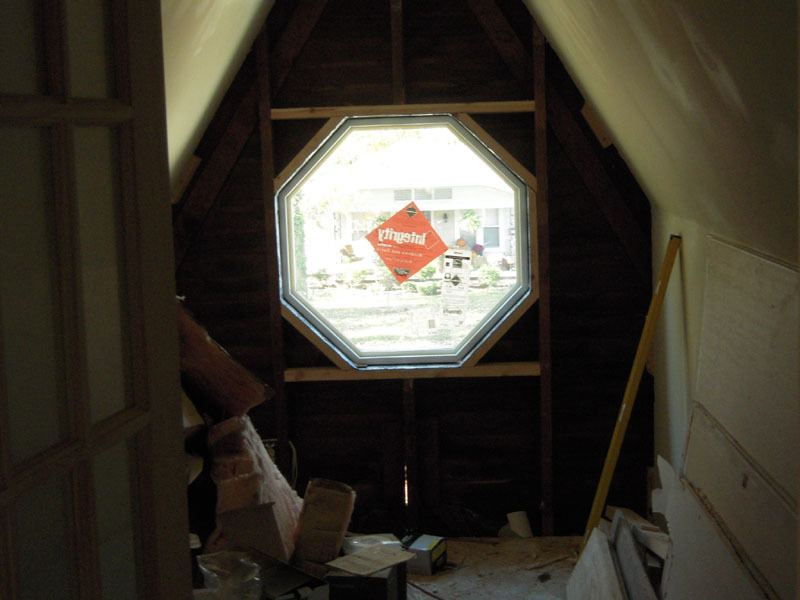 We use a little cardboard mock up to visualize and we settle on a 3′ octagonal window to replace the 2′ original. 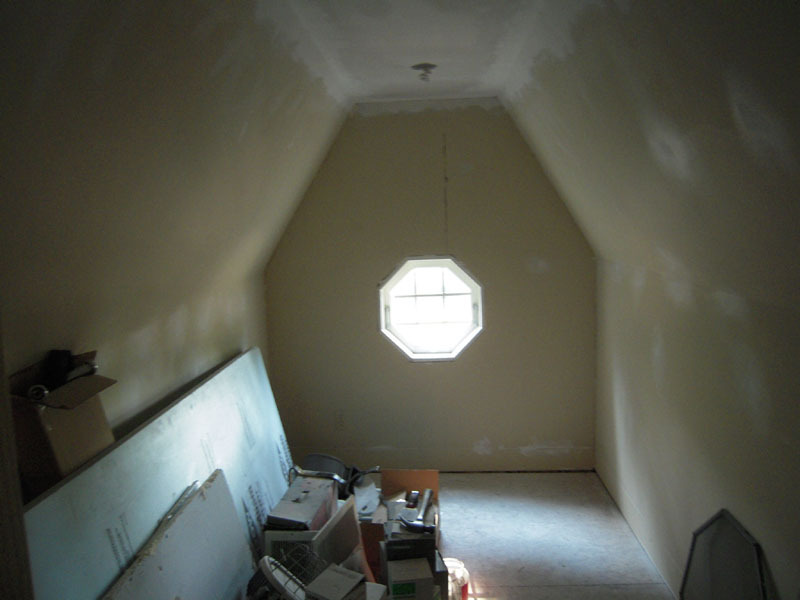 So with a little reframing and other gymnastics, we have our 3′ window in place. And we’re working on the outside as well. This will get a stone veneer in the years to come. 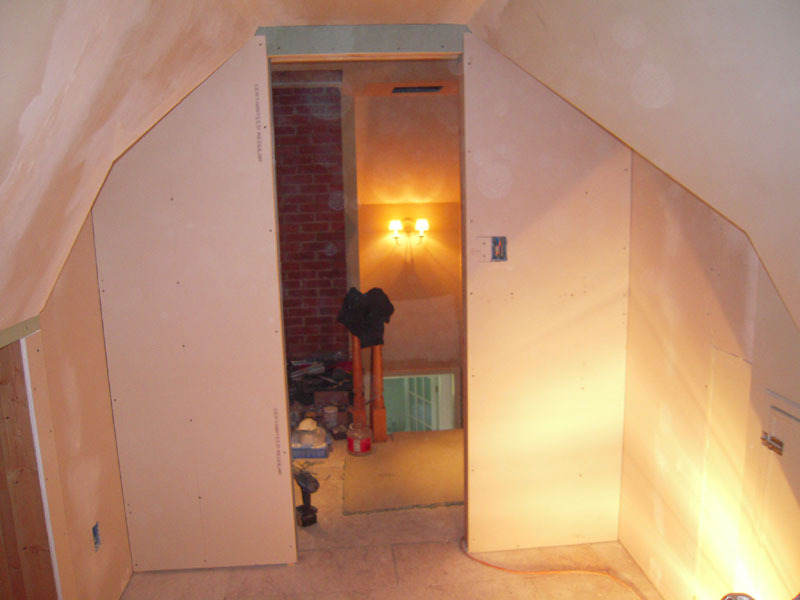 Stick with me, we’ll make a few more adjustments to the pointy closet – why, we might even make it pointy again.